How does the structure of such an important kinase (mTOR) differ from other kinases? Remember that there are 388 S/T Kinases, 90 Y Kinases and 40 atypical protein kinases in the human genome. The have the generic structure shown below with ATP and substrate binding between an N- and C-terminal lobes. The C lobe has a catalytic lobe which contains an Asp side chain acting as a general base in nucleophilic attack on the gamma P of ATP. A disordered activation loop in the C lobe often prevents substrate binding to the enzyme and keeps the kinase in an inactive state. 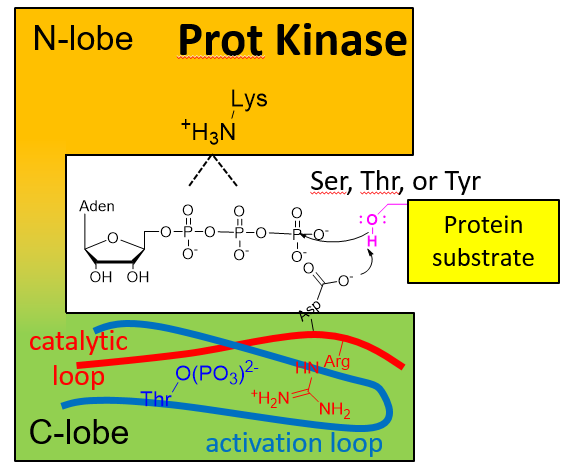 On phosphorylation of the activation loop or elsewhere, or substrate binding, conformational changes lead to movement of the activation loop away from the active site, activating the kinase activity. Compared to generic protein kinases, mTOR has several insertions (about 200 amino acids) into the protein sequence and these must be involved in determination of its specificity toward protein substrates. The C-terminal domain structure of the mTOR kinase is show below. The FAT domain proceeds the mTOR kinase domain. The FRB is inserted into the N lobe of the kinase domain whereas the LBE and FATC are inserted into the C lobe of the kinase domain. The domain structure of the mTOR kinase with bound AGS, a nonhydrolyzable ATP analog, is shown in the Jsmol below (4jsp) in comparison to the unbound form (4jsn) not shown. 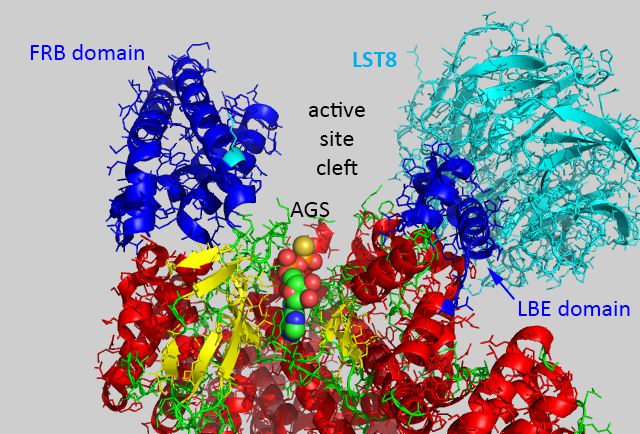 The figure below shows mTOR (4jsp) with the LST8 protein bound through the kinase LBE domain and with bound AGS, a nonhydrolyzable ATP analog. Now imagine the FKBP:RAMP complex binding to the FRB domain in the figure above and you can easily imagine how RAMP could inhibit a large protein substrate from binding. 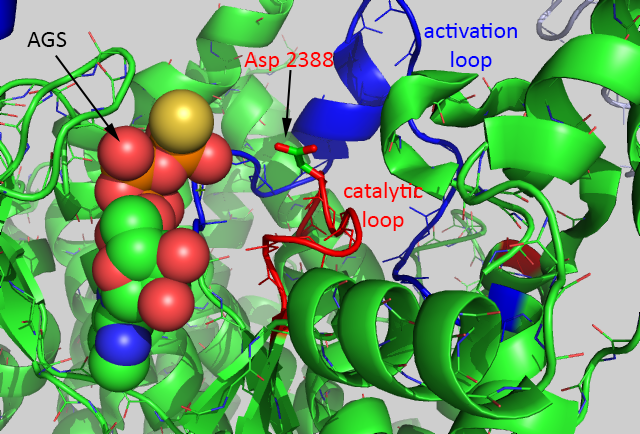 A close up of the active site of the kinase showing bound AGS, the catalytic loop (red) containing the general base Asp 2388, and the activation loop is shown below. The mTOR kinase seems to be always primed for catalysis since the Asp 2388 is in position to act as a general base. The FRB domain seems to be involved in directing substrate access (such as S6K1) and hence in controlling substrate specificity. Binding of FKBP:RAMP to the FRB domain would prevent substrate binding. Important substrates for each complex are shown below. Eukaryotic Translation Initiation Factor 4E Binding Protein 1 (EIF4EBP1): This protein inhibits translation by binding eukaryotic translation initiation factor 4EIF (eIF4E). In the absence of active IF4EBP1, eIF4E is part of a complex that recruits 40S ribosomal subunits to the 5' end of mRNAs, which allows the initiation of translation. The binding protein inhibits complex assembly and represses translation. Active mTORC1 phosphorylates the binding protein in a variety of conditions (UV irradiation and insulin) which leads to dissociation of the binding protein which allows eIF4E to initiate translation. Ribosomal S6 kinase 1 (RPS6KB1 aka S6K1) : This is a Ser/Thr kinase involved in proliferation, protein synthesis, cell growth, and cell proliferation. It phosphorylates eIF4B. In nutrient depletion (non-growth conditions), it forms a complex with the EIF3 translation initiation complex which inhibits translation. Under growth conditions, it is phosphorylated by mTORC1, causing its dissociation from the EIF3 complex and activation of translation.. The active form then phosphorylates and activates several substrates in the pre-initiation complex, including the EIF2B complex and the cap-binding complex component EIF4B. In the presence of amino acids both EIF4EBP1 and S6K1 are phosphorylated. If amino acids are depleted, they are dephosphorylated. Lipin 1 (LPIN1): This is a phosphatase which converts phosphatidic acid to diacylglycerol in triglyceride synthesis. Interesting, it also a transcriptional coactivator with PPARs (peroxisome proliferator activated receptors) to modulate genes involved in lipid synthesis. 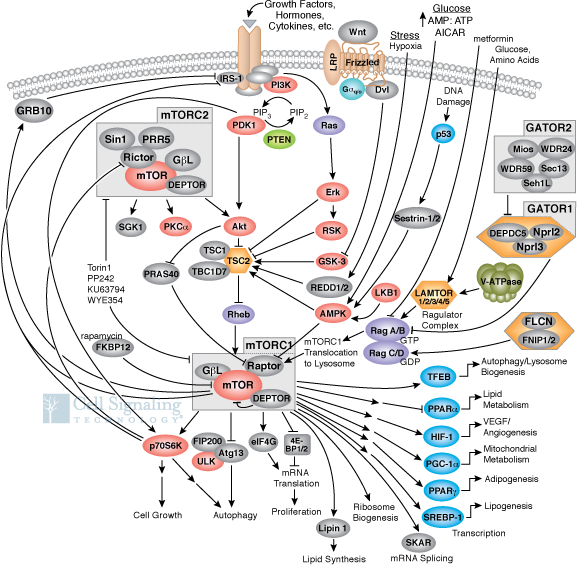 A summary figuring showing mTORC1 signaling is shown below. Akt (also known as Protein Kinase B): This is a Ser/Thr kinase which is involved in the regulation of metabolism, proliferation, cell survival, growth and angiogenesis. It has a notable role in the movement of the glucose GLUT4 transporter to the cell membrane in response to insulin signaling. Akt also interacts with mTORC1. Serum/Glucocorticoid Regulated Kinase 1 (SGK1): This serine/threonine protein kinase is involved in cellular stress response. It activates certain potassium, sodium, and chloride channels. It also activates membrane transporters, enzymes, and transcription factors. Its effects regulate neuronal activity, cell growth, proliferation, survival, migration and apoptosis. Protein Kinase C alpha (PRKCA): This is a Ser/Thr kinase involved in cell adhesion, proliferation, differentiation and migration. Rho and Rac: These are small G protein involved in cytoskeletal structure and cell cycle. . 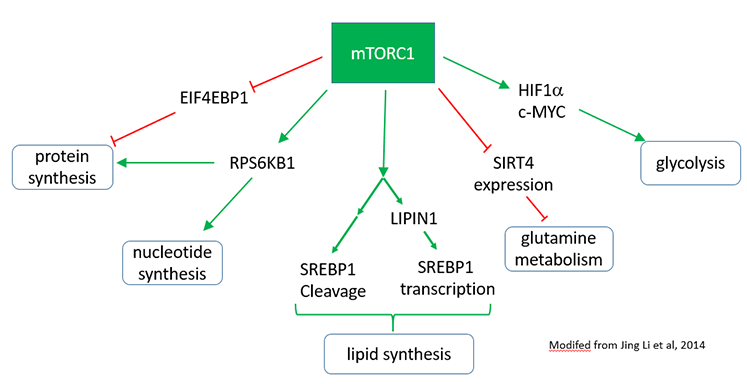 The figure below shows a more complete pathway of activation, regulation, and activity of both mTORC1 and mTORC2. The illustration is used with courtesy of Cell Signaling Technologies (www.cellsignal.com). This chapter section will mostly focus on mTORC1.